Last night I watched a hugely enjoyable drama on BBC4 – “We’ll Take Manhattan”. It’s the story of the young David Bailey (and if people know the name of just one photographer it’s quite likely to be Bailey) and his favourite model/muse Jean shrimpton. Now I have no idea how accurate to their real story this drama was, but it did remind me how much I love his work, in particular his portraiture. In the early 90’s I taught the History of Photography to aspiring photographers in Cardiff, and I make no excuse for being absolutely fascinated by this beautiful medium, it’s developments (technical, artistic and social).Bailey was a huge inspiration to me as a young photographer and is someone whose influence I can still see in my work today. The work of great photographers like Bailey has a way of seeping into the subconscious and I happily embrace these nods back to my heroes. So I thought today, inspired by that drama, I would share an example of how a Bailey shot inspired one of my own favourite wedding portraits. A few years back I was asked to shoot Sara and Richard’s wedding at The lovely Ashton Memorial in Lancaster’s Williamson Park. It was to be a somewhat retro styled wedding (right up my street! ), very black and white, very 1960’s in style. Sara and Richard were great, and totally open to my suggesting we try incorporating some 60’s influenced shots. 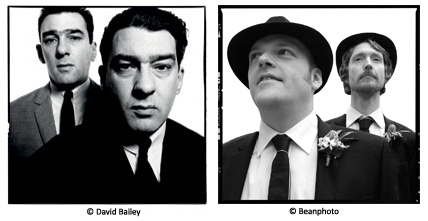 When I discovered there would be two best men, both in dark suits, white shirts and thin black ties, my mind flashed back to Bailey’s iconic portrait of Reggie and Ronnie Kray, the 60’s East End gangland villains, and I suggested we might try to do something similar. I love it when clients trust you enough to do stuff like this! I’m whilst I’m reminded of Sara and Richard, this is also a great excuse for me to re-post one of my absolute favourite wedding photo moments. A crazy, chaotic image in which everyone seems to be doing their own thing, and yet, for me, it still all comes together and works brilliantly! I kinda like Bailey but he’s a bit dated for me, for me it was John Swannell that provided inspiration when I started studying, such a shame that those inspiring characters who made photography exciting are now so easily lost in a sea of mediocrity!